It was in 1845 that Richard Wagner – in typical fashion – took time off from his duties as Royal Kapellmeister in Dresden in search of some R&R. In the spa town of Marienbad he conjured up the story for his next opera, Lohengrin, supposedly mostly in his bath. In the summer of the following year Wagner rented rooms in a peaceful rustic farmhouse in Graupa (not far from Dresden) and he finished the compositional sketch in a very short time. I have been to the house which still remains something of a shrine to Wagner (for details click here). Lohengrin is one of the most – perhaps the most? – accessible of Wagner’s operas and tells a fairly straightforward, romantic, medieval, and mystical morality tale of a battle between good and evil. It was the first fruit of the composer’s fascination with the Holy Grail myths of Arthurian legend. Here he has Christianity as the new religion fighting the remnants of the old faith as personified by Ortrud, an evil sorceress. Lohengrin’s chivalric honour is set against her mind tricks that lead a girl in need to doubt her defender’s background and causes him to leave her forever. Telramund – the guardian of the dead Duke of Brabant’s children – accuses the Duke’s daughter Elsa of killing her brother Gottfried in order to succeed her father. A trial is demanded and her ‘champion’ Lohengrin miraculously appears. He challenges Telramund on her behalf and defeats him. Lohengrin wants little from Elsa except(!) that she marries him and never enquires about his name or where he came from. Incandescent about her husband’s banishment after the trial, Ortrud plants suspicion in Elsa’s mind until she cannot hold back from asking the forbidden questions and then pays the ultimate price for her misgivings: Lohengrin reveals himself as a Knight of the Holy Grail who must now leave her. Andreas Homoki’s staging – with Wolfgang Gussmann’s sets and costumes – is a basically simple affair with an intriguing premise making it something I always wanted to see in the theatre since it was first put on in Zurich in 2014 (review click here). All the acts are played out in a rather plain room with ochre wooden-panelled walls on three sides with hidden doors and many tables and chairs. It is left to those we see in their green hunting jackets and hats, lederhosen or white-bodiced traditional drindls to bring this Lohengrin to life. 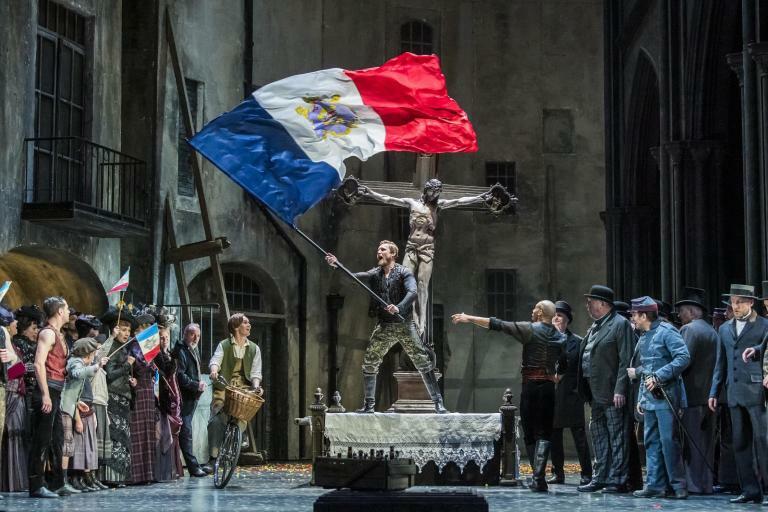 This they do for the most part with committed performances, some fine singing, and a beautifully vibrant account of the score from the wonderful Staatsoper Orchestra on their very best behaviour. Another prominent motif is the entr’acte curtain that carries two huge flaming hearts which apparently is a 1820 votive picture from a pilgrimage church in the South Tyrol’s Eisack Valley. Beneath this has been added (in old German script) Elsa’s words from Act II ‘Es gibt ein Glück’ (There is a happiness). We also see this as a small framed picture at the rear of the stage which Elsa is a bit obsessed by (in much the same way as Senta is with the Dutchman’s portrait in Der fliegende Holländer). Possibly Elsa is seeking the unending happiness we all crave sometimes in our lives but come to realise is often an unobtainable illusion. What Homoki does wonderfully is to illuminate how – after her father’s funeral – Telramund had aspired to Elsa’s hand and shows during the Prelude to Act I how she ‘leaves him at the altar’. He then falls victim Ortrud’s machinations because she wants to be the real power behind the throne of the next ruler of Brabant. Ortrud does not really love Telramund but inflames his ambition and ensnares him into marrying her instead. If you are that way inclined it should be possible to probe a little deeper beneath the surface of some straightforward storytelling, particularly in the Austrian capital of all places. Hitler wrote in Mein Kampf: ‘At the age of twelve, I saw … the first opera of my life, Lohengrin. In one instant I was addicted. My youthful enthusiasm for the Bayreuth Master knew no bounds’. There is speculation that a Jewish professor rejected Hitler’s application to study at Vienna’s Academy of Art and Bavarian beer halls – that would have looked rather like Homoki’s mise-en-scène – were the frequent venues for his political rallies. Perhaps it is better not to probe! Perhaps the one misstep is the size of Homoki’s swan! In Act I Elsa cradles a rather simple swan ornament that during a hyperactive maelstrom – with everyone circling around – transmogrifies into Lohengrin. He is first seen dressed in a simple white smock and writhing on the floor unable to stand. When he disappears at the end and Elsa has lost all hope, she is left just with his sword, horn and ring to remember him by as Gottfried reappears in the same foetal position as we first see Lohengrin. In the story Ortrud had bewitched Gottfried and turned him into the swan: I was left uncertain whether he was now alive or dead. All that is clear is that Ortrud is the winner and Elsa the loser in Homoki’s version. Andreas Schager is in his late 40s and came recently from operetta to the Wagner roles he seems to be singing everywhere at the moment as if he is trying to make up for lost time. If you see his Operabase page there are all the Eriks, Tannhäusers, Parsifals, Tristans and Siegfrieds he has sung recently or should be singing soon. 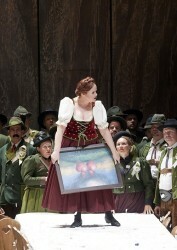 Now in the middle of this hectic schedule – that also includes other roles in non-Wagner operas! – he made a rare appearance in Vienna to sing his first Lohengrins. His career as a Wagner tenor only began in 2009 and this role debut may already have come too late. I suspect it is easy to be impressed by his stentorian voice when he seems to have so few rivals these days in the roles he is cast in. He can look the part of the Swan Knight compared to some Wagner tenors on stage today, has clear diction and secure top notes but phrasing is disappointingly neglected and there is a tendency to push his voice when under pressure. ‘In fernem Land’ had little nuance or radiance and overall his Lohengrin sounded like the lovechild of Siegfried and Tristan rather than the son of Parsifal! Thankfully it was the singers around Schager that made this revival a memorable one. Elza van den Heever is a fine committed actress; her inner turmoil was completely believable, and it was possible to see her doubts about Lohengrin growing and growing. Her dramatic soprano voice had the vocal range required allied to the necessary purity of tone and laser-bright top notes. In this version of the Lohengrin story King Henry (Kwangchul Youn) was a bourgeois Bürgermeister with the Herald (Clemens Unterreiner) as his officious clerk. Youn’s voice was authoritative and sonorous and Unterreiner brought more charisma – physically and vocally – than is usual to his role. Evgeny Nikitin’s forthright Telramund had the necessary volume but lacked colour, sounding too much like an Alberich and he found his Act II ‘Durch dich musst ich verlieren mein’ Ehr’ monologue rather challenging. Nevertheless he showed particularly well how his Telramund was a weak man of misguided and vain ambition. Petra Lang enters Homoki’s Lohengrin like a Kellnerin working at Oktoberfest who is fed up having to serve all the people she sees in her beer hall. Hands firmly on hips, scowling as only she can, it was clear those around her had better watch out. To remind us she was a wicked witch she added some maniacal laughter, silently …or not so silently. Later when Ortrud gate-crashes the wedding feast Lang leapt onto the tables and vehemently kicked off all the floral centrepieces. Then she nearly crowned Elsa with her ‘Es gibt ein Glück’ picture before just merely being content to put her fist through it! This was an Ortrud of terrifying intensity and Lang was a magnificent Maleficent and the personification of wickedness. ‘Entweihte Götter’, her invocation to the dark arts in Act II, was electric and culminated in a hair-raising – in the best way – sustained top note at ‘Rache’ and her concluding ‘Fliegt heim’ was suitably exultant. Once again it is the incredible span of notes that Petra Lang has at her disposal that is so remarkable. Finally I must mention the superb contribution of the men and women of the Staatsoper chorus and the impassioned conducting of Simone Young, a conductor I have not seen enough of since her Mahler ‘Resurrection’ Symphony in London eleven years ago. I will repeat something I wrote then that was as true for Wagner as it was for Mahler: ‘She was fascinating to watch, at exuberant moments conducting with her left foot raised from the podium, her arms, head and torso almost always in motion. That she studied piano is clear from the left arm and waggling fingers that appear to be accompanying the music as if to underwrite the contribution of the splendid musicians in front of her.’ From the Act I Prelude to a musically transfigurative ending she was fully supported again by her ‘splendid musicians’ with the orchestra’s mellifluous strings, warm woodwinds and mightily impressive brass. Young drove the performance on impressively by never particularly indulging the singers and some of the orchestral tuttis were viscerally exciting. In conclusion: Young and director Andreas Homoki, along with some exceptional performances, made this Lohengrin some of the most compelling Wagner that I have seen in Vienna since my first visits there over forty years ago. For more about what is on at the Wiener Staatsoper click here.